Iveta grew up in the Czech republic where her father would often design items and commission local potters to make them. He would also take her to ceramic galleries , so it is hardly surprising that Iveta grew up with an interest in ceramics. She decided to attend a pottery class at school and later studied ceramics at college for four years, developing a broad knowledge of creating, decorating, glazing, and firing. However, she found it difficult to find work in ceramics, and could not afford her own kiln, so she got a job working on cartoons production at Czech TV. In 1996 Iveta settled in Sussex, and after several different jobs she had saved enough money to equip a basic studio and started making ceramics, initially as a hobby.Her first craft fair was at Goodwood, where her clocks and a few coasters were well received. 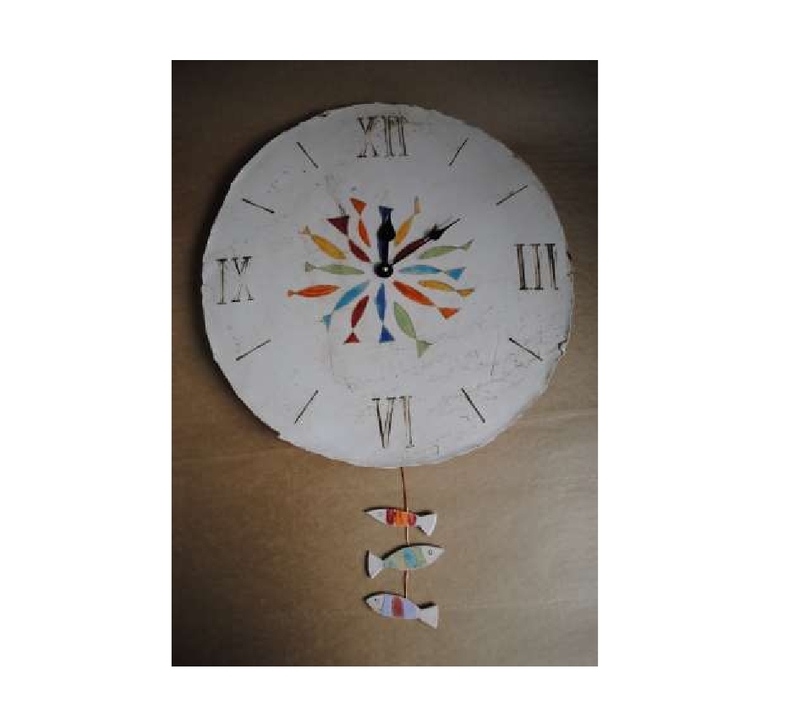 Iveta has always made clocks and still loves making them, she enjoys the whole process of creating something from an idea which can come from anywhere at any time. Her first one was a free-standing triangle shaped clock, the concept has evolved to the shape that you see now, from an interesting stone that she saw in her garden with curved sides and top. It suits her style, as she enjoys making things in an unusual shape. In 2004, she decided to make her hobby a business. Since then, she has expanded her range of items to include tea lights, candle-holders, jewellery, flowerpots, ceramic boats, bird baths for the garden, wind chimes, wall plates, mirrors, pencil holders and vases, which are now sold in galleries and to private collectors both in the UK and overseas, including Japan, Australia and USA. The Surrey Guild is delighted her work is now also available in the Gallery in Milford. Iveta’s pottery is made in white earthenware or stoneware. The fresh and contemporary design is achieved using techniques such as engraving, carving and stamping following minimalistic decoration with oxides and colourful glazes, they are finally fired in an electric kiln to 1020°C or 1240°C. 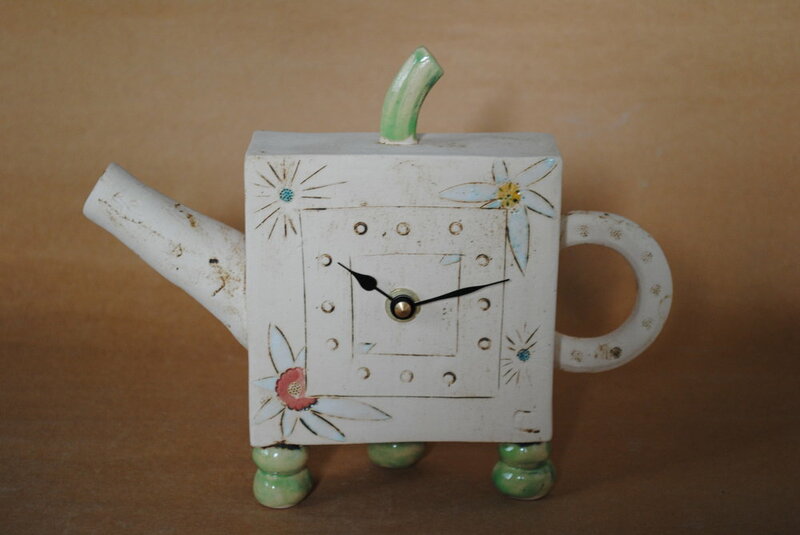 In 2018 her clocks appeared on a BBC2 programme called The Great Pottery Throw Down. The production company asked her if they could use a few of her clocks for the episode shown in February in which contestants had to make clocks. Two of her pieces were in a selection of work placed on the judges’ table, which was very exciting for her! Iveta still gets lots of enjoyment and never tires of developing new ideas and designs.